v, 46 p. : ill. ; 28 cm. "Submitted as final report for Nongame Wildlife Program project NG88-022". represent policy of the Commission. analysis and review. Fla. Game and Fresh Water Fish Comm. Nongame Wildl. Program Final Rep. 46 pp. + v. Tallahassee, FL. baseline data for comparisons of the relative abundance of birds in different habitats. agricultural areas, urban areas, rangeland, and beaches. were designed to determine the effects of timber management on bird populations. mining, agriculture, urbanization, forest fragmentation, and fire. (e.g., hardwood and pine forests) is confounded by the peninsula effect. and dissertations produced by students at the University of Florida. help during all phases of this project. James D. Lowe, Diane L.
data base at the Cornell Laboratory of Ornithology. Susan I.
Frances C. James also made useful comments on the manuscript. Fish Commission's Nongame Wildlife Program NG 88-022.
serves as baseline data, so comparisons can be made in the future. attempt to summarize quantitative studies of birds in Florida. observer competence, season, and plot size. these programs will not be evaluated here. the winter analogue of the BBC, in 1948.
comparisons of their avifaunas (James and Wamer 1982). technique called rarefaction (James and Wamer 1982). xeric oak forest to pine-xeric oak. 1979), it is unreliable to estimate species richness directly from area. species richness (Heck et al. 1975) for subsamples of a given sample. on the plot and ten species had less than one territory (denoted by '+'). were used throughout this analysis. birds would be unlikely to be evenly distributed. published results) were not included in the analysis. database contains only the 1989 counts. in Appendix A and B are used to identify counts throughout the text. necessarily an indication of statewide abundance or distribution. Population Studies (WBPS) took place. Ref. No. No. No. No. Num. Habitat type Sites Cts. Sites Cts. 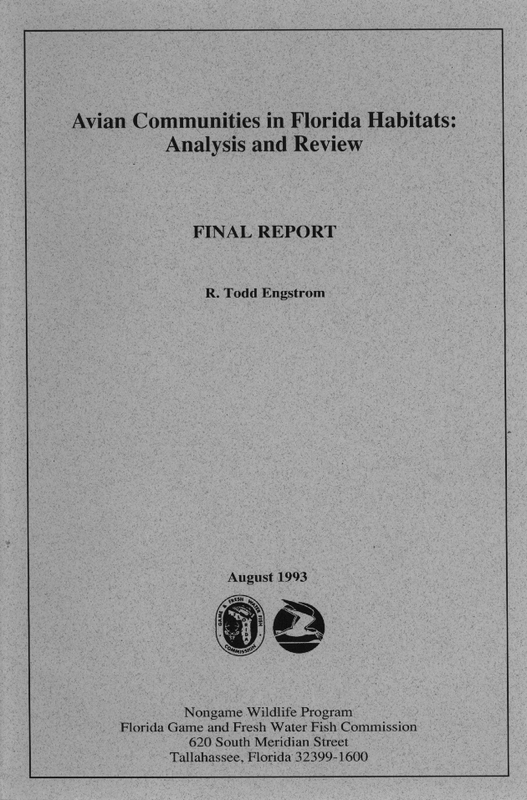 classification system (Florida Department of Transportation 1985). Figure 1. The distribution of Breeding Bird Censuses (BBCs) in Florida, by county. Figure 2. The distribution of Winter Bird Population Studies (WBPSs) in Florida, by county. stages of secondary succession following clearcutting of pine forests. and 46), and Collier (numbers 4-7) counties. individuals standardized to 8.1 ha [E(S 8.ha)] for each of these plots. Table 2. Species richness estimated for Breeding Bird Censuses in Floridaa. a BBCs 4-7 and 48 were not included in the analysis because plot size was <8.1 ha. b Reference numbers refer to Appendix A.
c S represents the total number of species found on the plot. d N.lha is the number of individuals expected on a plot of 8.1 ha. occur on 8.1 ha (N8s.1h) from rarefaction. f Habitat type numbers refer to Table 1.
and Count 34 was based on an abbreviated sample period. Table 3. Species richness estimated for Winter Bird Population Studies in Floridaa. a WPBSs 9-11, 29-37, and 44 were not included in the analysis because plot size was <8.1 ha. b Reference numbers refer to Appendix B.
c Ns.ha is the number of individuals expected on a plot of 8.1 ha. d E(S8. ha) is the number of species estimated for a sample of N8. ha individuals from rarefaction. censused for more than one year. and then rounded the average to the nearest integer. of 3 years) contained the most individuals and species of all habitats. turkey oak in north Florida was the most species-rich (Figure 5). hickory hammock and maple swamp held the most species (Figure 7). (numbers 18-20 in Appendix B) ranked unexpectedly high. were censused for more than one year. for plots that were censused for more than one year. fire, and coastal habitats for migrating birds. to conversion to urban and related land use. in Florida has occurred in pinewoods (softwoods). site preparation, and conversion from natural forests to plantations. a Breeding Bird Censuses and Winter Bird Population Studies are not included. farmland in the midwestern U.S. (Noss 1989). permanent residents, 13 winter residents, and 4 summer residents. turkey oak (Quercus laevis) in Putnam County (Humphrey et al. were killed in two severe freezes in the winters of 1985 and 1989.
grove lacked notable members of the savanna avifauna. comparable to the density found in natural habitats before urbanization. (Dendroica pinus), and Bachman's sparrow (Aimophila aestivalis). (Quiscalus quiscalus), and northern cardinal (Cardinalis cardinalis). central Florida are a mixture of spoil mounds, lakes, and "reclaimed"
bird species and individuals in older unreclaimed pits and spoil piles. typically use cypress ponds in Florida. maintain upland pine forests in the southeastern United States. burned shoreline as along an unburned control. particularly important for birds during fall and spring migration. in large and small maritime hammocks in Duval and Nassau counties. of coastal habitat are probably important for migrant birds. important part of the community. hardwood hammock in Alachua County. information on numbers of birds in specific habitats. The BBC (not BBS) has been used to monitor local populations. or with the CBC and WBPS. among plots (Engstrom and James 1984). supported relatively more bird species with species-poor habitats. pine forests in southern Florida and the northern Bahama Islands. winter were left unfilled in other seasons. coniferous forests to have fewer species than deciduous forests. and WBPS provide a substantial foundation for such an endeavor. quantitative vegetation samples are collected with the bird counts. national and state-owned forests and encouraged on private lands. encouraged to publish their studies of Florida bird communities. a widely accessible computerized data base. native plants in new housing developments (see Mills et al. 1989). of birds and other vertebrate wildlife. for use by consulting companies to which the state issues contracts. Arrhenius, 0. 1921. Species and area. J. Ecology 9:95-99. 1987. U.S. For. Serv., Res. Bull. SE-101. 61 pp. Abstract. Univ. Presses Fla., Gainesville. 718 pp. Wildl. Serv., Biol. Rep. 90(1). 166 pp. the species-area relationship. Am. Nat. 113:791-833.
bird species occupying maritime hammocks of northeast Florida. Wild. Program Tech. Rep. No. 4, Tallahassee, Fla. 75 pp. Florida vegetation types. Fla. Sci. 44:1-13.
a reproductive failure in 1986. Condor 89:636-653. Emlen, J.T. 1971. Population densities derived from transect counts. in land bird populations on the Florida peninsula. Am. Nat. mapping method. Omit. Scand. 9:31-39.
censusing. Stud. Avian Biol. No. 6:421-425.
exclusion: a 15-year study. Wilson Bull. 96:437-450. Bird Population Studies. Condor 83:34-41. Bird Census. Am. Birds 38(1):19-23.
of sites for conservation. Biol. Cons. 15:229-239. Appalachian forest. Am. Birds 38:14-18. Florida forest fragments. Proc. Annu. Conf. Southeast Assoc. Fish and Wildl. Agencies 38:87-96. L.D. White, J.E. Johnston, D.G. Milchunas. 1975. Impact of forest plantations on north Florida wildlife and habitat. determination of sufficient sample size. Ecology 56:1459-1461. Florida flatwoods. Fl. Sci. 42:142-151. Humphrey, S.R. 1985. Fort George Island: fall migrant forest birds. citrus grove. Wildl. Soc. Bull. 13:487-496.
and alternative parameters. Ecology 52:577-586.
and diversity of avian communities. Auk 98:785-800.
habitat description. Aud. Field Notes 24:727-736.
temperate forest bird communities and vegetation structure. breeding birds on Plummer's Island, Maryland and vicinity. Proc. Biol. Soc. Washington 100:762-68. Kolb, H. 1965. The Audubon Winter Bird-Population Study. Aud. For. Serv., South. For. Exp. Stn. Gen. Tech. Rep. SO-68. 293 pp. nesting birds in slash pine plantations of north-central Florida. M.S. Thesis, Univ. Florida, Gainesville. 57 pp. abundance in three plant communities in Putnam Co., Florida. Assoc. Fish and Wildl. Agencies 38:111-120.
components of an endangered ecosystem. Natur. Areas Journ. L.A. Rowse, W.R. Marion, and L.D. Harris. 1985. Numerical responses of flatwoods avifauna to clearcutting. Fl. terrestrial birds. Studies in Avian Biology No. 6.
bird communities of the longleaf pine forest of north Florida. M.S. Thesis, Univ. Florida, Gainesville. 41 pp. northern Florida. J. Wildl. Manage. 49:1088-1098.
for a mapping method in bird census work. Am. Birds 24:3-6. 1979. Effect of forest fragmentation on bird populations. Pages 198-212 in R.M. DeGraaf and K.E. Evans, tech. coords. birds. U.S. For. Serv., Gen. Tech. Rep. NC-51. and Wildl. Serv., Res. Publ. 157, Washington, D.C.
populations of tropical Florida in relation to the vegetation. Ph.D.
and J.A. Kushlan. 1974. The southern Florida avifauna. In Memoir 2: Environments of south Florida: present and past. Florida woodlands: comparisons with areas north of Florida. flatwoods. M.S. Thesis, Univ. Florida, Gainesville. 66 pp. Sanders, H.L. 1968. Marine benthic diversity: a comparative study. State Mus. Spec. Sci. Rep. No. 3, Gainesville, FL. 192 pp. ecology. Pages 150-165 in K.L. Dickson, J. Cairns, Jr., and R.J.
Terborgh, J. 1989. Where have all the birds gone? Princeton Univ. Tomialojc, L. 1980. The combined version of the mapping method. Deutsche Avifaunisten, Gottingen, W. Germany. evaluation. Chapman and Hall, London. Van Velzen, W.T. 1972. Breeding Bird Census instructions. Am. wetland. Am. Midl. Nat. 89:334-347. Florida. MS. Thesis, Florida State Univ., Tallahassee. 39 pp. White, L.D., L.D. Harris, J.E. Johnston, and D.G. Milchunas. 1975. Impact of site preparation on flatwoods wildlife habitat. In Proc. forest and range habitats for nongame birds. U.S. For. Ser., Gen.
Tech. Rep. WO-1, 343 pp. maple climax community. Ecol. Monogr. 6:317-408. Florida suburb. Bull. Florida State Mus. 13:1-83. Board of Health Monogr. No. 12:110-117. Appendix A. List of Breeding Bird Censuses (BBCs) conducted in Florida. Association. Aud. Field Notes 14:497-498. 2. Baker, W.W. 1989. BBC 25. Mature Beech-Magnolia Forest. J. Field Omith. 60:39. 3. Caprio, A., and D.L. Taylor. 1982. BBC 87. Cutover Subtropical Slash Pine Forest. Am. 5. 1982. BBC 89. Virgin Subtropical Slash Pine Forest-December Bur. Am. 7. 1982. BBC 91. Virgin Subtropical Slash Pine Forest-Unburned Control. Am. 8. Christman, S.P. 1984. BBC 171. Gulf of Mexico Barrier Island. Am. Birds 38:119-120. 9. Engstrom, R. Todd. 1981. BBC 32. Mature beech-magnolia forest. Am. Birds. 35:58. 10. 1982. BBC 31. Mature beech-magnolia forest. Am. Birds. 36:61. Association. Aud. Field Notes 15:524. Association. Aud. Field Notes 16:527-528. Hammock. Aud. Field Notes 22:676-680. 14. 1968. BBC 29 (1967). Live Oak-Cabbage Palm Coastal Hammock. Aud. 15. 1968. BBC 29 (1968). Live Oak-Cabbage Palm Coastal Hammock. Aud. 16. 1968. BBC 30 (1966). Oak-Palm-Hickory Hammock and Maple Swamp. 17. 1968. BBC 30 (1967). Oak-Palm-Hickory Hammock and Maple Swamp. 18. 1968. BBC 30 (1968). Oak-Palm-Hickory Hammock and Maple Swamp. 19. 1968. BBC 58 (1967). Citrus Grove. Aud. Field Notes 22:708-710. 20. 1968. BBC 58 (1968). Citrus Grove. Aud. Field Notes 22:708-710. 23. 1982. BBC 187. Cordgrass Salt Marsh II. Am. Birds 36:99-100. 24. Little, C.D. 1981. BBC 68. Slash Pine-Turkey Oak Forest. Am. Birds 35:66. Pine Forest. Am. Birds 35:70. 26. McDonald, M.V. 1982. BBC 188. Gulf Coast Salt Marsh. Am. Birds 36:100. 27. 1983. BBC 176. Gulf Coast Salt Marsh. Am. Birds 37:100. 28. 1984. BBC 170. Gulf Coast Salt Marsh. Am. Birds 38:119. 29. 1985. Unpublished BBC 113. Gulf Coast Salt Marsh. Am. Birds 39:114. 30. 1986. Unpublished BBC 92. Gulf Coast Salt Marsh. Am. Birds 40:71. 32. 1988. Unpublished BBC 72. Gulf Coast Salt Marsh. Am. Birds 42:148. 33. 1989. BBC 81. Gulf Coast Salt Marsh. J.Field Ornith. 60:68. 34. 1990. Gulf coast salt marsh. J.Field Orith. 61:77. 35. Niemi, G.J. 1981. BBC 81. Longleaf Pine Forest. Am. Birds 35:69. 37. Post, W. 1981. BBC 200. Salt Marsh. Am. Birds 35:99. 38. Robertson, H. M., C.F. Sumner, H.W. Werner, and G.E. Woolfenden. 1968. BBC 31. Live Oak-Cabbage Palm Hammock. Aud. Field Notes 22:684. 39. Vemick, K., and D.L. Taylor. 1981. BBC 82. Cutover Subtropical Slash Pine Forest. Am. 42. West, R.L. 1989. BBC 82. Longleaf Pine Forest-April Burn. J. Field Omith. 60:68-69. 43. 1989. BBC 83. Longleaf Pine Forest-Unburned Control. J. Field Omith. 44. Woolfenden, G. E. 1969. BBC 50. Sand Pine Scrub. Aud. Field Notes 23:733-734. 45. 1969. BBC 51. Scrubby Flatwoods. Aud. Field Notes 23:734-735. 48. 1969. BBC 54. Low Flatwoods with Bayhead. Aud. Field Notes 23:738. 49. Woolfenden, G.E., S.A. Rohwer, J.A. Stevenson, C.F. Sumner, and C.E. Winegamer, 1967. BBC 34. Live Oak-Cabbage Palm Hammock. Aud. Field Notes 21:635-637. 50. and R.G. Allan. 1958. BBC 15. Longleaf Pine-Turkey Oak Association. Association. Aud. Field Notes 13:466. 1. Baker, W.W. 1989. WBPS 2. Mature Beech-Magnolia Forest. J. Field Omith. 60:7-8. 3. 1990. WBPS 23. Recently burned Scrubby Flatwoods. J. Field Omith. 4. Connor, H., and R.W. Loftin. 1985. WBPS 54. Barrier Beach and Saltwater Estuary. 5. Fisk, E. J. 1975. WBPS 46. Pineland, Scrub, and Residential. Am. Birds 29:770. 6. 1976. WBPS 38. Pineland, Scrub, and Residential. Am. Birds 30:1055. 7. 1978. WBPS 31. Pineland, Scrub, and Residential. Am. Birds 32:33-34. 8. 1979. WBPS 33. Pineland, Scrub, and Residential. Am. Birds 33:27. 9. Good, J.M. 1982. WBPS 9. Slash Pine. Am. Birds 36:31. 10. 1982. WBPS 51. Canal and Associated Spoil Bank. Am. Birds 36:41. 11. 1982. WBPS 70. Avocado Grove. Am. Birds 36:45. Coastal Hammock. Aud. Field Notes 23:531-533. 13. 1969. WBPS 16 (1968). Live Oak-Cabbage Palm Coastal Hammock. Aud. 14. 1969. WBPS 16 (1969). Live Oak-Cabbage Palm Coastal Hammock. Aud. 15. 1969. WBPS 17 (1967). Oak-Palm-Hickory-Hammock and Maple Swamp. 16. 1969. WBPS 17 (1968). Oak-Palm-Hickory-Hammock and Maple Swamp. 17. 1969. WBPS 17 (1969). Oak-Palm-Hickory-Hammock and Maple Swamp. 18. 1969. WBPS 43 (1967). Citrus Grove. Aud. Field Notes 23:547-549. 19. 1969. WBPS 43 (1968). Citrus Grove. Aud. Field Notes 23:547-549. 20. 1969. WBPS 43 (1969). Citrus Grove. Aud. Field Notes 23:547-549. 22. Loftin, R.W. 1970. WBPS 40. Grazed Pasture with Ponds. Aud. Field Notes 24:564-565. 23. 1971. WBPS 36. Grazed Pasture with Ponds. Am. Birds 25:654-655. 26. 1989. WBPS 14. Barrier Beach and Saltwater Estuary. J. Field Ornith. 27. 1990. WBPS 27. Barrier beach and saltwater estuary. J.Field Omith. 28. Lohrer, F.E. 1990. WBPS 28. Mature citrus orchard. J. Field Ornith. 61:20. 29. Moseley, L. H. 1969. WBPS 49. Suburban School Park. Aud. Field Notes 23:552. 30. 1970. WBPS 46. Suburban School Park. Aud. Field Notes 24:566-567. 31. 1971. WBPS 48. Suburban School Park. Am. Birds 25:660. 32. 1972. WBPS 48. Suburban School Park. Am. Birds 26:683-684. 33. 1973. WBPS 54. Suburban School Park. Am. Birds 27:696. 34. 1974. WBPS 69. Suburban School Park. Am. Birds 28:726-727. 35. 1975. WBPS 80. Suburban School Park. Am. Birds 29:787. 36. 1976. WBPS 78. Suburban School Park. Am. Birds 30:1073. 37. 1978. WBPS 70. Suburban School Park. Am. Birds 32:47. 38. NeSmith, C. 1983. WBPS 14. Mature Beech-Magnolia Forest. Am. Birds 37:34. 39. NeSmith, C., and J. Cox. 1984. WBPS 109. Longleaf Pine Forest. Am. Birds 38:63. 40. Patterson, G.A., and W.B. Robertson, Jr. 1981. WBPS 34. South Florida Slash Pine. 41. 1981. WBPS 35. Slash Pine Cypress Mosaic. Am. Birds 35:30-31. 42. Robertson, H. M., H.L. Shoffner, C.F. Sumner, H. Werner, C.E. Winegarer, and G.E. 43. Wass, M. 1955. WBPS 22. Sheltered Beach. Aud. Field Notes 9:301. 45. Wilson, J., and R. W. Loftin. 1979. WBPS 100. Barrier Beach and Saltwater Estuary. 47. 1981. WBPS 56. Barrier Beach and Saltwater Estuary. Am. Birds 35:36. 1982. WBPS 50. Barrier Beach and Saltwater Estuary. Am. Birds 36:41. 1983. WBPS 49. Barrier Beach and Saltwater Estuary. Am. Birds 37:42. 1984. WBPS 69. Barrier Beach and Saltwater Estuary. Am. Birds 38:56. G. E. 1970. WBPS 29. Sand Pine Scrub. Aud. Field Notes 24:559. 1970. WBPS 30. Scrubby Flatwoods. Aud. Field Notes 24:559.
numbers refer to reference numbers in Appendix A.